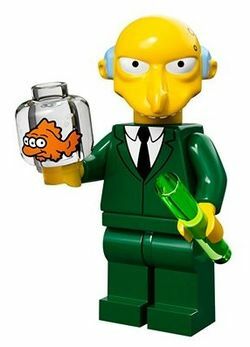 Montgomery Burns is a minifigure released in 2014 as a part of The Simpsons theme. He is Homer Simpson's boss. Montgomery Burns has, like most of the Simpsons minifigures, an uniquely molded Yellow head with white teeth and Light Royal Blue hair. His face also has a few Black pockmark patterns. He wears an Earth Green suit with Black tie and White undershirt. His legs are also Earth Green. His accessories are a Transparent Bright Green 3 stud long stick of radioactive waste and a Transparent minifigure head with a 3-eyed Orange fish printed on it. He is an enemy of the Simpsons but seems to forget them a lot. He has to be reminded by his butler Smithers. He is Homer Simpson's boss. Monty Burns is the owner of the Nuclear Plant, Homer’s boss, and officially the Most Despised Man in Springﬁeld. A merciless multi-billionaire with a heart of lead, Mr. Burns enjoys taking long walks on the beach…where he dumps radioactive waste into the ocean. Montgomery Burns Monty Burns is the owner of the Nuclear Plant, Homer’s boss, and officially the Most Despised Man in Springﬁeld. A merciless multi-billionaire with a heart of lead, Mr. Burns enjoys taking long walks on the beach…where he dumps radioactive waste into the ocean. This page was last edited on 12 January 2016, at 23:29.